Thank you all for the information and input. If I complete the purchase, I will post more pics of the reproducer. 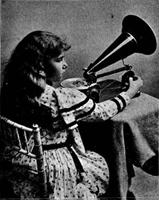 The package includes 48 records including the E Johnson Gram-O-Phone record. Another Zonophone Type "C" with a "Linene" horn. A beautiful example. Thanks for sharing. "The rubber-collar backing found on later Concert and Exhibition models, after March 1903, was the work of L. F. Douglass, 902,280, and the locking collar pin was developed by J. C. English soon after (877,184). According to L. MacFarlane's 1917 The Phonograph Book, (Vitaphone co-inventor) Henry Jones developed the tubular rubber gaskets for R. L. Gibson's Victor Exhibition reproducer (750,460), but cf. A. S. Bowley's Brit. pat. 11,747 of 1899. Gibson also received a 104 royalty per unit. See also J. W. Jones' soft rubber washers at his 604,829 and H. Jones/Gibson's later 726,937." Thanks Allen. That is great information and helps confirm my suspicion that the Henry Jones soundbox patents were used by the American Talking Machine’s Vitaphone reproducer and subsequently adapted by Johnson for the exhibition and possibly New Century reproducer.